On the verge of death, the barely living man known as Hagane was brought back to life by advanced cyber-technology performed by a mysterious old man named Momochi. However, none of Hagane's body survived except his brain... Already a powerful ninja, he now had the incredible power and speed of a human cyborg. With this power, he vowed to take revenge on the Koma faction. The Fuma and Koma clans who live mainly in darkness have mastered the secret arts of the ninja and black magic. Although they look just like normal people, they have strength and spiritual power beyond normal human beings. Each clan consists of several groups called "factions". The Fuma clan is split into factions based on the Chinese zodiac. For example, the cow, the tiger, and the dragon. 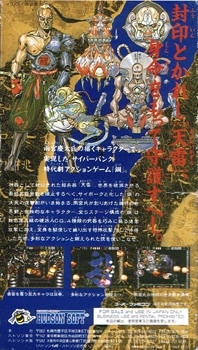 The Koma clan is split into factions by color; consisting of the white, the gold and the red dragon. In the case of the Fuma clan, members of a given faction know nothing more about any other factions except that they exist. Their blood lines are cut off from the outside world and are destined to decline. it came in a cartrige together with another 7 games or the like. 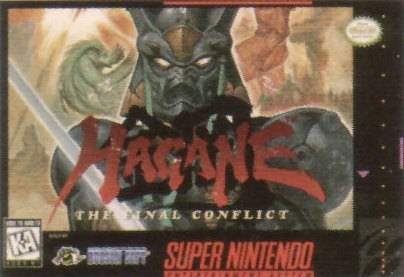 On of the best action game on the Snes. Unfortunately quality =/= sales, in this unfair world we live in.